This article is about the Japanese aircraft. For other uses, see Ōka (disambiguation). The Yokosuka MXY-7 Ohka (櫻花, Ōka, "cherry blossom"; 桜花 in modern orthography) was a purpose-built, rocket-powered human-guided kamikaze attack aircraft employed by Japan against Allied ships towards the end of World War II. United States sailors gave the aircraft the nickname Baka (バカ, "fool" or "idiot"). Ohka Model 11 replica at the Yasukuni Shrine Yūshūkan war museum. October 1944 (unpowered), November 1944 (powered). 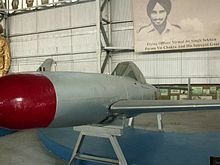 The MXY-7 Navy Suicide Attacker Ohka was a manned flying bomb that was usually carried underneath a Mitsubishi G4M2e Model 24J "Betty" bomber to within range of its target. On release, the pilot would first glide towards the target and when close enough he would fire the Ohka's three solid-fuel rockets, one at a time or in unison, and fly the missile towards the ship that he intended to destroy. The design was conceived by Ensign Mitsuo Ohta of the 405th Kōkūtai, aided by students of the Aeronautical Research Institute at the University of Tokyo. Ohta submitted his plans to the Yokosuka research facility. The Imperial Japanese Navy decided the idea had merit and Yokosuka engineers of the Yokosuka Naval Air Technical Arsenal (Dai-Ichi Kaigun Koku Gijitsusho, or in short Kugisho) created formal blueprints for what was to be the MXY7. The only variant which saw service was the Model 11, and it was powered by three Type 4 Mark 1 Model 20 rockets. 155 Ohka Model 11s were built at Yokosuka, and another 600 were built at the Kasumigaura Naval Air Arsenal. The final approach was difficult for a defender to stop because the aircraft gained high speed (650 km/h (400 mph) in level flight and 930 km/h (580 mph) or even 1,000 km/h (620 mph) in a dive. Later versions were designed to be launched from coastal air bases and caves, and even from submarines equipped with aircraft catapults, although none were actually used in this way. It appears that the operational record of Ohkas includes three ships sunk or damaged beyond repair and three other ships with significant damage. Seven U.S. ships were damaged or sunk by Ohkas throughout the war. The USS Mannert L. Abele was the first Allied ship to be sunk by Ohka aircraft, near Okinawa on 12 April 1945. The Ohka pilots, members of the Jinrai Butai (Thunder Gods Corps), are honored in Japan at Ohka Park in Kashima City, the Ohka Monument in Kanoya City, the Kamakura Ohka Monument at Kenchō-ji Zen temple in Kamakura, Kanagawa, and the Yasukuni Shrine in Tokyo. Thermojet powered Model 22; note the jet intake on the side just forward of the tail. The only operational Ohka was the Model 11. Essentially a 1,200-kilogram (2,600 lb) bomb with wooden wings, powered by three Type 4 Model 1 Mark 20 solid-fuel rocket motors, the Model 11 achieved great speed, but with limited range. This was problematic, as it required the slow, heavily laden mother aircraft to approach within 37 km (20 nmi; 23 mi) of the target, making them very vulnerable to defending fighters. There was one experimental variant of the Model 11, the Model 21, which had thin steel wings manufactured by Nakajima. It had the engine of the Model 11 and the airframe of the Model 22. 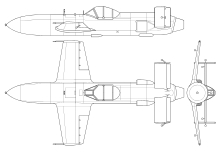 The Ohka K-1 was an unpowered trainer version with water ballast instead of warhead and engines, that was used to provide pilots with handling experience. Unlike the combat aircraft, it was also fitted with flaps and a landing skid. The water ballast was dumped before landing but it remained a challenging aircraft to fly, with a landing speed of 130 mph (210 km/h). Forty-five were built by Dai-Ichi Kaigun Koku Gijitsusho. The Model 22 was designed to overcome the short standoff distance problem by using a Campini-type motorjet engine, the Ishikawajima Tsu-11. This engine was successfully tested, and 50 Model 22 Ohkas were built at Yokosuka to accept this engine. The Model 22 was to be launched by the more agile Yokosuka P1Y3 Ginga "Frances" bomber, necessitating a shorter wing span and much smaller 600-kilogram (1,300 lb) warhead. The first flight of a Model 22 Ohka took place in June 1945; none appear to have been used operationally, and only approximately 20 of the experimental Tsu-11 engines are known to have been produced. The Model 33 was a larger version of the Model 22 powered by an Ishikawajima Ne-20 turbojet with an 800-kilogram (1,800 lb) warhead. The mothership was to be the Nakajima G8N Renzan. Model 33 was cancelled due to the likelihood that the Renzan would not be available. Other unbuilt planned variants were the Model 43A with folding wings, to be launched from submarines, and the Model 43B, a catapult/rocket assisted version, also with folding wings so that it could be hidden in caves. A trainer version was also under development for this version, the two-seat Model 43 K-1 Kai Wakazakura (Young Cherry), fitted with a single rocket motor. In place of the warhead, a second seat was installed for the student pilot. Two of this version were built. Finally, the Model 53 would also use the Ne-20 turbojet, but was to be towed like a glider and released near its target. The Yokosuka MXY7 Ohka was used mostly against U.S. ships invading Okinawa, and if launched from its mothership, could be effective because of its high speed in the dive. In the first two attempts to transport the Ohkas to Leyte Gulf using aircraft carriers, the carriers Shinano and Unryu were sunk by the U.S. submarines Archerfish and Redfish. Attacks intensified in April 1945. On 1 April 1945, six "Bettys" attacked the U.S. fleet off Okinawa. At least one made a successful attack; its Ohka was thought to have hit one of the 406 mm (16 in) turrets on the battleship West Virginia, causing moderate damage. Postwar analysis indicated that no hits were recorded and that a near-miss took place. The transports Alpine, Achernar, and Tyrrell were also hit by kamikaze aircraft, but it is unclear whether any of these were Ohkas from the other "Bettys". None of the "Bettys" returned. 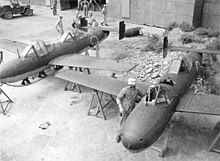 The U.S. military quickly realized the danger and concentrated on extending their "defensive rings" outward to intercept the "Betty"/Ohka combination aircraft before the suicide mission could be launched. On 12 April 1945, nine "Bettys" attacked the U.S. fleet off Okinawa. The destroyer Mannert L. Abele was hit, broke in two, and sank, witnessed by LSMR-189 CO James M. Stewart. Jeffers destroyed an Ohka with AA fire 45 m (50 yd) from the ship, but the resulting explosion was still powerful enough to cause extensive damage, forcing Jeffers to withdraw. The destroyer Stanly was attacked by two Ohkas. One struck above the waterline just behind the ship's bow, its charge passing completely through the hull and splashing into the sea, where it detonated underwater, causing little damage to the ship. The other Ohka narrowly missed (its pilot probably killed by anti-aircraft fire) and crashed into the sea, knocking off the Stanly's ensign in the process. One Betty returned. On 14 April 1945, seven "Bettys" attacked the U.S. fleet off Okinawa. None returned. None of the Ohkas appeared to have been launched. Two days later, six "Bettys" attacked the U.S. fleet off Okinawa. Two returned, but no Ohkas had hit their targets. Later, on 28 April 1945, four "Bettys" attacked the U.S. fleet off Okinawa at night. One returned. No hits were recorded. May 1945 saw another series of attacks. On 4 May 1945, seven "Bettys" attacked the U.S. fleet off Okinawa. One Ohka hit the bridge of a minesweeper, Shea, causing extensive damage and casualties. Gayety was also damaged by an Ohka's near miss. One "Betty" returned. On 11 May 1945, four "Bettys" attacked the U.S. fleet off Okinawa. The destroyer Hugh W. Hadley was hit and suffered extensive damage and flooding. The vessel was judged beyond repair. On 25 May 1945, 11 "Bettys" attacked the fleet off Okinawa. Bad weather forced most of the aircraft to turn back, and none of the others hit targets. On 22 June 1945, six "Bettys" attacked the fleet. Two returned, but no hits were recorded. Postwar analysis concluded that the Ohka's impact was negligible, since no U.S. Navy capital ships had been hit during the attacks because of the effective defensive tactics that were employed. Model 43 K-1 Kai rocket assist trainers; note the landing skid. K-1: U.S. Navy Museum, Washington, D.C.
^ "Ohka" aerospaceweb.org. Retrieved: 16 October 2010. ^ Francillon 1971, p. 118. ^ Stafford, 2000, p. Index. ^ a b Francillon 1979, p. 477. ^ Francillon 1979, p. 476. ^ Mikesh and Abe 1990, p. 262. ^ Francillon 1971, p. 117. ^ Francillon 1979, p. 478. ^ a b c Francillon 1979, p. 481. ^ "Yokosuka MXY7-K1 Ohka". National Museum of the US Air Force™. Retrieved 2018-02-22. ^ Francillon 1979, pp. 478, 482. ^ Francillon 1979, pp. 441, 479. ^ Francillon 1979, p. 482. ^ Mayo, Wayland. "Japanese Suicide Weapons: The Kugisho MXY7-K1 Ohka." b-29s-over-korea.com. Retrieved: 1 August 2011. ^ a b c d Kightly, James. "Yokosuka Ohka Kamikaze Pilot." Aeroplane, Volume 39, No. 7, Issue no. 459, July 2011, pp. 30–31. ^ Sun, Eun Ae (6 October 2017). "SENSHA: Ohka-based Interceptor Fighter". sensha-manual.blogspot.com. ^ Francillon 1979, pp. 481–482. Francillon, Ph.D., René J. Japanese Aircraft of the Pacific War. London: Putnam & Company Ltd., 1970 (2nd edition 1979). ISBN 0-370-30251-6. Francillon, Ph.D., René J. "Mitsubishi G4M "Betty" and Ohka Bomb" Aircraft in Profile, Vol. 9. Windsor, Berkshire, UK: Profile Publications Ltd., 1971. ISBN 0-85383-018-5. Maloney, Edward T. and the Aeronautical Staff of Aero Publishers, Inc. Kamikaze (Aero Series 7). Fallbrook, California: Aero Publishers, Inc., 1966. Mikesh, Robert C. and Shorzoe Abe. Japanese Aircraft, 1910-1941. London: Putnam Aeronautical Books, 1990. ISBN 0-85177-840-2. Sheftall, M.G. Blossoms in the Wind: Human Legacies of the Kamikaze. New York: New American Library, 2005. ISBN 0-451-21487-0. Stafford, Edward P. Little Ship, Big War: The Saga of DE343. Annapolis, Maryland: Naval Institute Press, 2000. ISBN 1-55750-890-9. 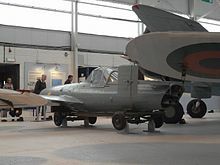 Wikimedia Commons has media related to Yokosuka MXY 7 Ohka. "Baka... Flying Warhead", C.I.C. (Combat Information Center), U.S. Office of the Chief of Naval Operations, June 1945.